March 19, 2012, 5:24 p.m.
Listenership growth to news/talk/information radio overall has leveled off, but NPR says digital is where the growth is. By Andrew Phelps March 19, 2012, 5:24 p.m.
NPR radio content attracted fewer weekly listeners in 2011 than the year before, despite adding new member stations across the country. The data was released today as part of the Pew Research Center’s State of the Media report for 2012. The drop wasn’t huge — down about 1 percent from 2010, according to NPR’s numbers — but it was the first decline since 2007 and it happened in a year when the number of stations carrying NPR programming increased. About 26.8 million Americans per week listened to NPR programming (newscasts and magazines) on member stations, down from 27.2 million the year before. Those numbers don’t cover public radio programming not produced or distributed by NPR — programs such as This American Life and Marketplace, local shows, or classical music blocks — and, importantly, they don’t include the growing number of Americans who listen to NPR audio online. The number of stations that carry NPR programming grew about 4.5 percent over that span — from 924 in fall 2010 to 966 in fall 2011. But the increase didn’t do much to grow NPR’s listenership because many were classical stations that carry little NPR programming, said Dana Davis Rehm, NPR’s senior vice president of marketing. “Our view is that radio isn’t in decline; public radio is actually expanding and as [NPR CEO] Gary Knell has said, it is going everywhere,” she emailed. “Our digital audience is exploding.” Rehm said NPR is working with stations to quantify the cumulative streaming audience across the system. One in eight Americans listened to news/talk/information radio in 2010, close behind the No. 1 genre — country music — but down slightly from 2008 and 2009, according to Arbitron. Rehm is referring to Portable People Meters, which represent a sea change in the way radio listenership is measured. The small devices, meant to be worn on the hip throughout the day, listen for hidden tones embedded in broadcasts. Arbitron has gradually introduced the meters to the 44 largest U.S. markets over the past few years. Public broadcasters in some markets saw sizable drops in ratings after the switch to meters. Previously, Arbitron relied on weekly diary entries from participants, placing a lot of importance on the forgetful human mind. As the thinking goes, people tend to exaggerate their own public radio listening in diaries, because, well, it makes them look smarter, but in reality they’re listening to more Delilah than they let on. The People Meters also capture incidental exposure — that is, contemporary soft favorites overheard in the doctor’s office — which hurts the news/talk stations. 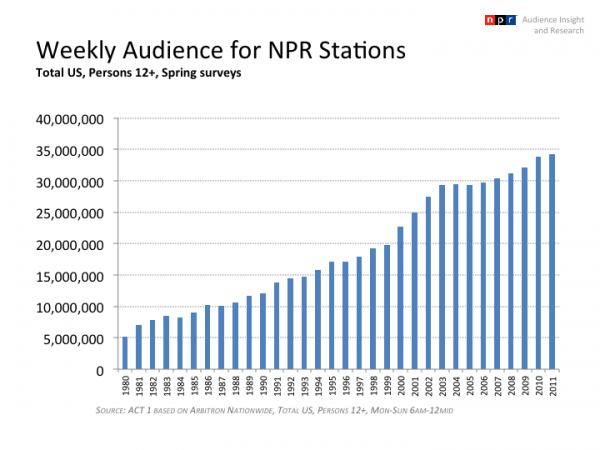 The weekly audience for all NPR stations — that includes non-news and non-NPR programming — rose slightly in 2011, reaching a record 34.3 million last spring, according to Arbitron data provided to me by NPR. That number has risen steadily since 1980, jumping up dramatically in 2000 and again in 2001 and exploding through 2003. That growth is attributed to coverage of Sept. 11 and the Iraq and Afghanistan wars. “The bottom line from our perspective is that the most valid measure of performance is audience ratings over time,” Rehm told me. “In that sense, NPR and public radio have done better than commercial radio and remain strong in spite of a small decline in [cumulative audience],” Rehm said. Still, the data in Pew’s report portends near-term challenges for radio. The State of the Media found 93 percent of survey respondents used terrestrial (AM/FM) radio, up slightly from the year before but down from 96 percent a decade earlier. “There is also evidence in the data that people listen to AM/FM out convenience rather than out of deeper appreciation for the content,” the report says. Less than a quarter of adults, 22%, said in a 2011 survey by Arbitron that they “love” local AM/FM radio. This is far less than those who reported “loving” other audio devices, including the iPhone (66%), Android smartphone (49%), digital video recorders (48%), iPod (46%), broadband internet (46%) and even satellite radio (39%). NPR has tried to buttress against disruption from new platforms. Earlier this year, the network announced a deal with Ford to carry its programming on 2012 car models equipped with SYNC technology. “Users can create playlists of stories and programs to listen to later or select from topics and then call them up with simple voice commands,” according to the news release. Last year, NPR released the Infinite Player to great applause, a Pandora-style app for news that serves as an experiment for the ways NPR will pursue new platforms for audio. Then again, podcasts never killed the radio star. Less than half of Americans know what a podcast is, and about a quarter of Americans used podcasts in 2011, according to the Pew survey. “The podcast, while still hitting a significant segment of the population, appears to be losing momentum,” the report says. NPR’s operating budget grew, about 7 percent for 2012, driven in large part by growth in fundraising. (Many of those dollars will go toward NPR’s coverage of the presidential election and the Olympic Games.) NPR’s news staff rolls grew by 9 percent in 2011, to 365 people. The network survived high-profile threats last year to its federal funding, which makes up a small share of its budget. POSTED March 19, 2012, 5:24 p.m.
Phelps, Andrew. 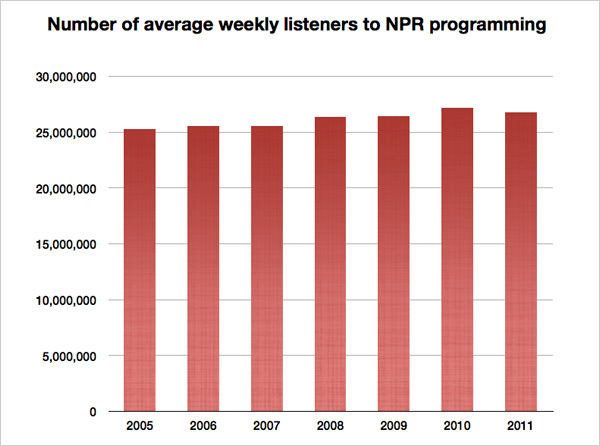 "NPR’s audience shrank a hair in 2011, pushing public radio further toward a digital future." Nieman Journalism Lab. Nieman Foundation for Journalism at Harvard, 19 Mar. 2012. Web. 18 Apr. 2019. Phelps, Andrew. "NPR’s audience shrank a hair in 2011, pushing public radio further toward a digital future." Nieman Journalism Lab. Last modified March 19, 2012. Accessed April 18, 2019. https://www.niemanlab.org/2012/03/nprs-audience-shrunk-a-hair-in-2011-pushing-public-radio-further-toward-a-digital-future/.